As crews continue digging New York City Tunnel Number Three, Mikey and Raph sneak in to watch the heavy machinery (the gigantic drill dubbed The Mole, in particular). The Mole strikes a strange metal sphere which separates like liquid into two large, humanoid robots. 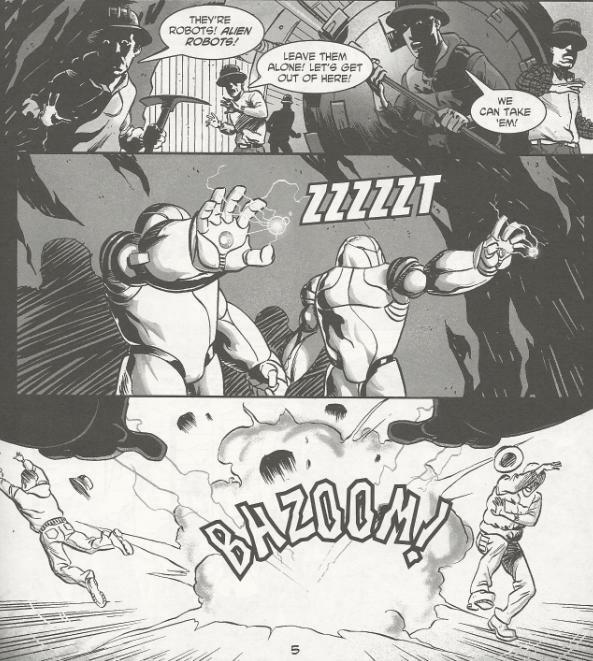 The frightened tunnel workers attack the robots and the robots send them running with several powerful energy blasts. As the robots link hands and stomp out of the tunnel, Mikey and Raph follow in secret. In the lair, Leo and Don watch the news with Splinter. The National Guard has been sent in to destroy the robots, but all their firepower simply bounces off their impenetrable armor. Leo and Don want to go help, but realize there isn’t anything they can do. As the robots waste Times Square, Mikey has a sudden epiphany. Once the military goes into retreat and they’re alone, Mikey comes out of the shadows and passively addresses the robots. He places his nunchakus on the ground and says he knows of a place where they’ll be safe. The robots follow him quietly, much to Raph’s confusion and anxiety. Leading the robots down into the sewers, Mikey tells Raph that he noticed the robots only attacked defensively. The way they’re constantly holding hands and looking at the world in curious awe also led him to believe that they’re baby robots. Raph is incredulous, but with no options at hand, lets Mikey lead the robots to the lair. Upon arriving, Mikey introduces the robots to the other Turtles and Splinter. The robots, in turn, introduce themselves by transforming back into a sphere. Their shiny chrome surface then plays a series of images showing their homeworld. It was destroyed by pollution, deforestation and global warming. The robots, the last children of the dominant race, were then scattered in pods across the universe so that their people could survive. Looking at the footage, Don notices something familiar about the alien homeworld. He finally fits it all together and comes to the conclusion that the “alien planet” was actually Earth in the days of Pangea. Apparently, there was once an advanced race that destroyed itself via industry and was eventually wiped clean from the Earth’s memory over millions of years… save the one memento left behind in the bedrock of New York. 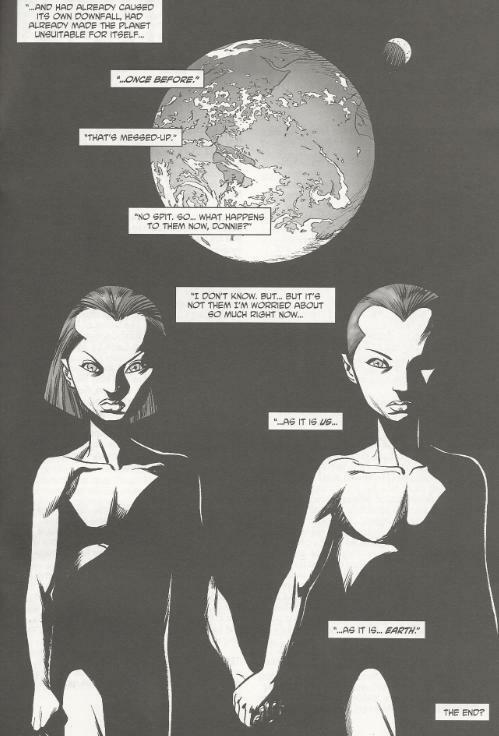 The robots then take their armor off and reveal themselves to be male and female human twins. Mike wonders what will become of the two children, but Donnie says that they shouldn’t worry about them. What they should worry about is the Earth, as humanity is on the fast path to repeating the process that nearly wiped it out during the Pangea age. *Continuity-wise, I would place this story during the Mirage "Volume 3" era. *The children of Pangea are never seen or referenced again. We never learn what became of them. *Incidentally, the fact that the Pangean humans were scattered about the universe may very well explain the existence of the human-like aliens seen populating outer space (mostly amongst the Federation) as far back as Fugitoid (microseries) #1. *The prophecy will fulfill itself as human civilization is destroyed by global warming in Tales of the TMNT (Vol. 2) #69. *According to Steve Murphy in the letters page of Tales of the TMNT (Vol. 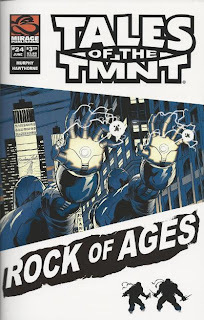 2) #25, this story was originally conceived as an issue of Archie's TMNT Adventures, but went unused. And so Steve Murphy gives us an issue of Tales that feels like it was a lost script from Archie’s TMNT Adventures. Unfortunately, it’s reminiscent of the bad TMNT Adventures, not the good TMNT Adventures. Story structure-wise, it’s similar to the Archie comic in how reactionary the Turtles are, not to mention how lackadaisical they are about the sanctity of their sewer lair. They’re just chillin’ and some weird robots show up so they invite them to hang back at their place; no biggie. The setting of the Turtles living in the sewer lair only gives it so many places it could fit in the Mirage timeline, as they spent less time living in the sewers in that series as you might think. 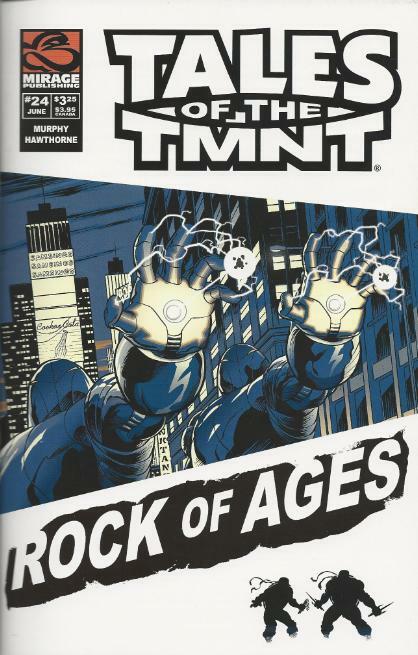 What makes “Rock of Ages” reek like a rotten issue of TMNT Adventures is the heavy handed environmental message, delivered with the utmost amount of damning finger-wagging as humanly possible. It’s nothing we haven’t heard before from Murphy a million times over the past twenty years. By 2006 the guy’s work has all the allure of a broken record. The children of Pangea are never seen or heard from or referenced again and neither is the mysterious super civilization of Earth’s past. As a result, this one-shot tale feels meaningless, amounting to nothing more than a vehicle for more of Murphy's trite and ill-executed messages. 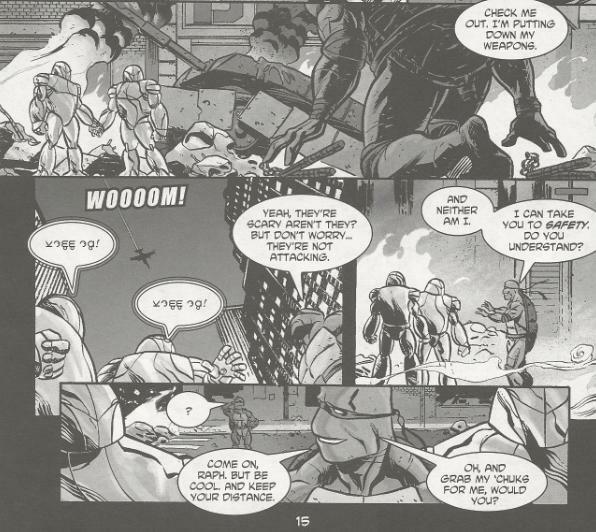 I was able to suffer Murphy’s way of bloating TMNT Adventures with annoying, frequent, terribly blunt environmentalist mumbo jumbo because it was a kid’s comic and he subscribed whole-heartedly to the notion that “kids are stupid and incapable of perceiving subtlety”. The Mirage comic, on the other hand, seemed to be targeted almost exclusively at adult collectors (or those were pretty much the only people buying the thing), so did we really need an issue where Murphy talks down to us about the environment like we’re a bunch of mentally handicapped 7 year-olds? As a saving grace, Mike Hawthorne’s art isn’t half bad, with a great flow of action between the panels and some handsomely rendered characters. He especially excels at drawing the cityscape of New York as well as military vehicles and carnage. A shame he got saddled with such a lousy script. That's a good point I hadn't considered, John. Although it's supposition, it could very well be the case. I'll add it to the Turtle Tips. Thanks! Personally, in the Mirage chronology I'd place this story between Tales< Vol.2 #66 and TMNT Vol.4 #1, because of its highly prophetic story. Correcting self: I forgot about the events of "Darkness Weaves" and the "Bad Moon Rising" mini-series, in which Splinter moved into the Jones farm to protect Shadow. Instead, I'd place it between "Eye of Aga-Moo-Tou" and "A Christmas Carol".